Tonight all the chairs were arranged in different patterns, covered with white cloth and tied with purple ribbons instead of the gold and other colors of previous nights. New incredible bouquets adorned each table and tonight there were lantern sized standing candle holders full of gorgeous flowers. I feel so privileged to experience these events. A backdrop with flowers was arranged on a stage with another nice couch. We walked through an archway of flowers and found seats from which we could see the stage. Waiters came by constantly with lovely fresh orange juice, strawberry or coconut drinks. And little dainty chocolate and lemon tarts. We sat and watched people for a long time. Tonight, as if by some silent agreement, the men mostly wore dark, western suits and ties and shiny black shoes. The men are impeccably dressed and groomed here. And all so well mannered… all men rise when a lady approaches. They offer their seats immediately. People kiss each other by touching cheek to cheek and a formal greeting, especially to a respected older person, is to touch the fingers of the right hand to the forehead while saying ‘salaam’. The elder person then touches the shoulder of the greeter, all very quickly and barely noticeable. When she lived abroad, she said, her neighbors etc. encouraged her to put up a sign with ‘room for rent’. She said that this idea was impossible because in Pakistan one would never ever charge a guest in your own house. There were no formal parts at all to the wedding celebration tonight. Bride and groom sat on the stage forever while almost everyone who came, got around them (each family group) and had their picture taken with them. Then they finally got off the stage and sat in chairs facing the stage and this famous group played music. Very, very nice young men with guitars and great voices. They played wonderful music. It was pleasant to just sit and watch and see all the gorgeous fabrics and colors of the ladies saris (most women wore a sari tonight). The colors and materials are just out of this world and never the same. We left close to midnight, before the food had even been served! house. On the street I noticed an enormous generator to create enough power for all the lights etc. for the party. I think that each house has it own generator. Our power goes off regularly, sometimes three times a day. Candles lined the drive like the fancy cars lined the street. While the owners mingle, the chauffeurs all visit and also eat, usually the tables are laden again after the guests eat, with all the same foods, and then the personnel, drivers and nannies come to eat. I can’t begin to imagine how much these weddings cost. My very last day in Lahore… I kept waking up during the night and was sound asleep when a girl knocked on my door and brought me breakfast in my room. Had a quick shower and then we left for the Grammar School – a nice 5 story brick building with open sitting areas on the roof and potted palms everywhere. I did two slideshow presentations for two groups of students and then a writing workshop with teachers from different schools. We had a tremendous wind storm today, with sand and leaves blowing in under the door. The power went off several times. At 11:30 PM the driver took my bags to the car and I said goodbye to everyone. Leila and her husband brought me to the airport, which wasn’t very far. We drove along a beautiful wide boulevard with green grass in the median. The airport was a gorgeous, new building with very tall arched windows and shiny marble floors, very very clean. The security was just like anywhere else. A man whisked my suitcases away, took me through security, immigration, customs and to the check-in counter. He didn’t leave until my luggage was gone and I had my boarding pass. I walked through the large airport towards the gate and would have a few hours to wait for my 3 AM flight. Immediately, a man from a coffee shop came and asked if I wanted tea or coffee. First I waved him away and did some window shopping. But once I sat down and a man asked, I said ‘sure, coffee’. Well… they should have this at every airport!! The guy went away and came back a bit later with a tray lovely laid out with a cup of strong coffee, milk, sugar, two slices or pound cake and some cheese sandwiches. I sat and enjoyed all this – for around two dollars! A nice Pakistani lady, living in Ottawa, sat near me and we chatted the time away. She gave me a great CD with wonderful (Pakistani) music! The flight from Lahore went on time and was fine. I slept most of the way. Had a few hours in Dubai and did some tax free shopping and visited Starbucks! This time it was light when we left Dubai so I saw the different buildings and the blue, blue sea. Dubai is sitting right in this amazing sand desert – nothing but waves of white sand. Previously, in the dark I had thought that it was all water but now I realized that it was an ocean of sand I saw. We flew with unobstructed views over Iran and Kuwait. There were a few clouds after that but I saw most of eastern Europe in great detail and took photos of Turkey, the Black Sea, Bulgaria, Yugoslavia and on over Munich and Holland to London. It’s been an incredible trip and I have learned more that ever. What an experience! I am so grateful to have been invited to Pakistan. So grateful to Kees for supporting me, encouraging me to go. So grateful to be a writer of books that lead me on this adventure. Our world can be a wonderful place, full of new friends – if only we are willing to meet them, by following new paths as well as our heart. 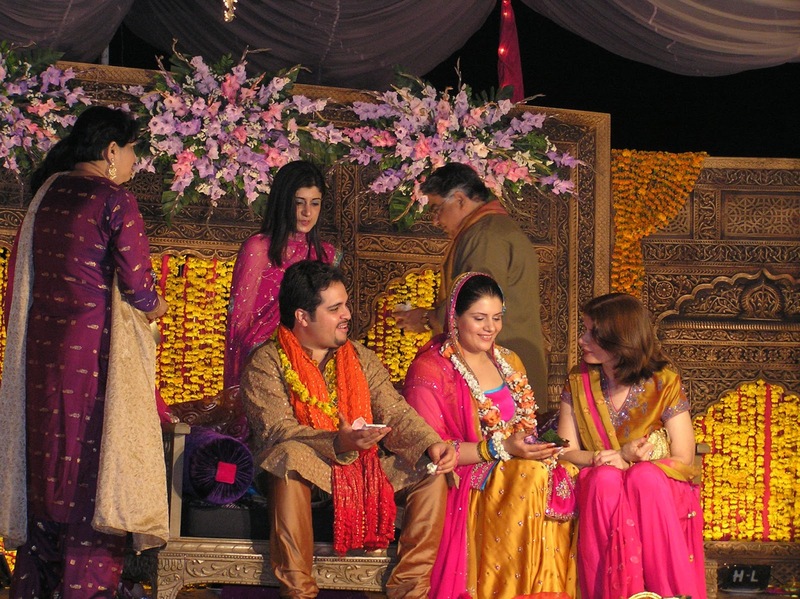 The wedding parties I am fortunate enough to experience during my visit to Pakistan, are not so much “just parties” to celebrate a wedding – they are all integral parts of the wedding. There was the thanksgiving, then the traditional singing evening. Tonight was a festival of song and dance, more festive and formal than the previous ones. First of all, it was THE occasion for the best and most glamorous outfits. The family dresses like royalty in long outfits of brocade and gold. These outfits look like long gowns but are actually pants with legs, but have huge puffy ruffles from the knees down. They date back to Moghul times. Many of the ladies wear headpieces with an ornament on the forehead, reminding me of Sheherazade. There were a few other westerners tonight, a young girl from Germany who teaches in an inner city school here as a volunteer, and some people from England. They had all had the same experience: everyone had warned them against going to Pakistan and they all marveled at how safe and wonderful it really is. They mostly blame the media. An older lady came and introduced herself to me. She and her husband had spent some years in Germany and lived in many places. He was a doctor. Now they had chosen to move back to Pakistan. She said “It is too bad there is such a difference between rich and poor.” I agree, especially tonight with all the richness and glitter, that difference was very obvious. We drove, dressed in our finest, past poor people working along the streets. “It is a vicious circle,” the lady sighed, “the rich have few children who get a good education and inherit their parents’ wealth in addition to having good work.” BUT, the rich seem to do a lot more here than they do elsewhere to bridge the cap. 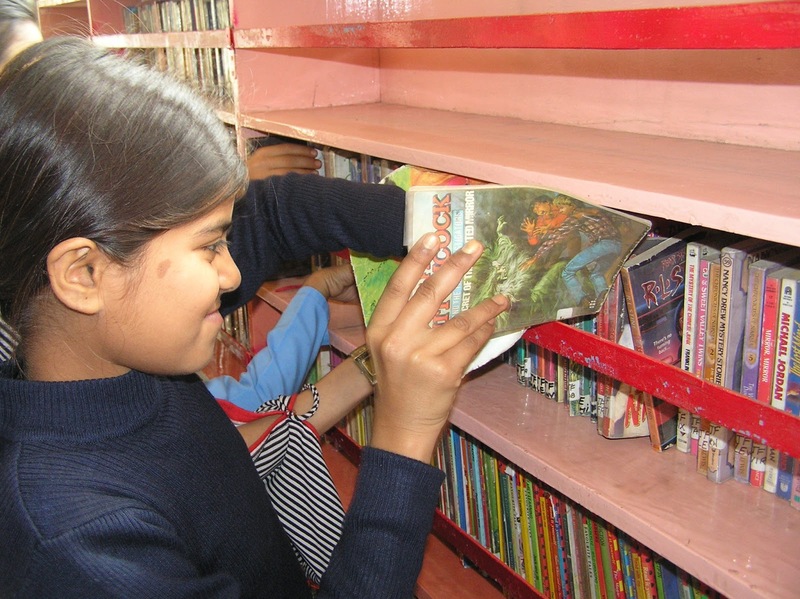 My friend Leila runs a library program full time and gives every day to the poor. This lady said that her husband now runs a clinic free of charge and she runs an orphanage. And most of the rich seem to do things like that – working full time in community service work. The rich also employ people. My friend’s family has ten people working, providing for their shelter, food and children’s education. Despite the poverty I have not seen street people. “People live with their families,” I am told when I ask about the homeless.The bride’s parents lived about a half hour outside Lahore. When we arrived, tall white cloth candles lined the length of the property. Everyone (a few hundred people) waited outside the entrance, on the road. Then the mehndi got unloaded: round stone pots, hand painted and decorated with glass and glitter. They had candles inside. Also small square tables and a paisley shaped table with decorations and candles on them. There were baskets filled with bangles (bracelets) for all the women. These were carried in by the women of the family while everyone chanted and sang. We all filed in through an archway decorated with flowers and walked into the tent. There the groom’s family waited and hung flower garlands (yellow flowers) around our necks. There was a stage decorated with flowers. A large couch awaited the bride and groom. As soon as we got to the main area, the dancing started. The women danced folk dances in a circle, typical Arabian dances, waving their arms and turning in and out. 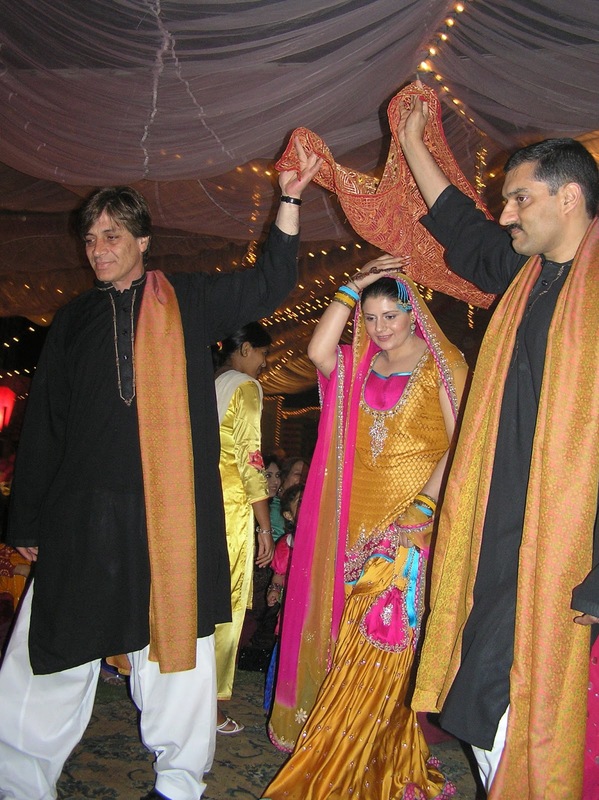 The groom was escorted to the couch under a canopy, by his friends all wearing long tunics and long yellow shawls. The bride was escorted by her family under a canopy and with candles. They both sat on the couch for the rest of the night while all their relatives came up on the stage and did three things: they smeared a little dab of henna on either the girl or the boy’s hand (depending who was their relative), put some sugarcoated anise seeds on their tongue and waved money bills around their heads, then dropped them by their feet. This was all to bless them and to ward off bad spirits. Again, all the money is for charity and must be quite a bit by now. Pakistan seems a country of contradictions to me. Rich – poor, dusty – glamourous, slow – fast, ancient – modern. It remains a strange sight to see women in long birka’s riding sideways on the back of a motorbike; a man on bare feet standing straight up while riding his donkey cart, a donkey cart piled high with about 50 wheelbarrows (8 high). I saw a regular sized van today, with about 40 people in it, no kidding. Leila and I spent a day at the office of Alif Laila, the library project, and got a lot of planning done: work on an international project between kids in schools here and there; work on the book, on a magazine they are planning. We drove to a few stores for things, including meat. The meat market was in a narrow street among many other shops. Each shop is a three walled square with a shopkeeper squatting inside, facing the street. Some shops have a wooden bed frame with ropes in front, where the shop keeper can rest if it is quiet. There are strange eating things outside, baskets with bakings and sweets, herbs, nuts and what not. Some shops have cages full of life chickens piled up outside. Today we saw a shop with wooden bird cages full of birds. We had also passed some bicycles with huge bird cages on the back. The cages are made out of wicker. I asked about the little birds, wondering if people ate them? And was told ‘No, you pay him money for a bird and then release it. It will help your wishes come true….’ So if someone is very ill, you ‘buy’ a bird, wish for good health and release the bird. There are so many street vendors, it makes me feel like I’m in the Middle Ages. I needed some elastic to put in the waist of my new pants (shalwar). ‘OK’, said Leila, ‘we will buy some.’ I thought we’d go to a shop but drove around until they spotted the roaming vendor. He had a long stick horizontally across his shoulder (and baggy pants, long shirt, droopy turban so there already was a general clutter). From the stick were hanging rows and rows of dangling things: laces, brushes, cloth, safety pins, sewing supplies, scissors and much much more. They were pinned to his coat and hanging four rows deep. He dug up packages of elastic and, when we paid, he had no change so gave her a bundle of safety pins instead. Suddenly Leila cried “Quick Margriet, go look!” and behind our car a tall, old man had appeared out of nowhere: a snake charmer! He carried a large bag and a flute. He asked me if I want to see the snake dance and I said yes! I grabbed some money and he untied the cloth lid of a small stone jar. Out came a little snake which he put in the driveway and started to play. The snake only made attempts at freedom and swore each time the man grabbed it again. The flute sounded cool and it was a neat experience! 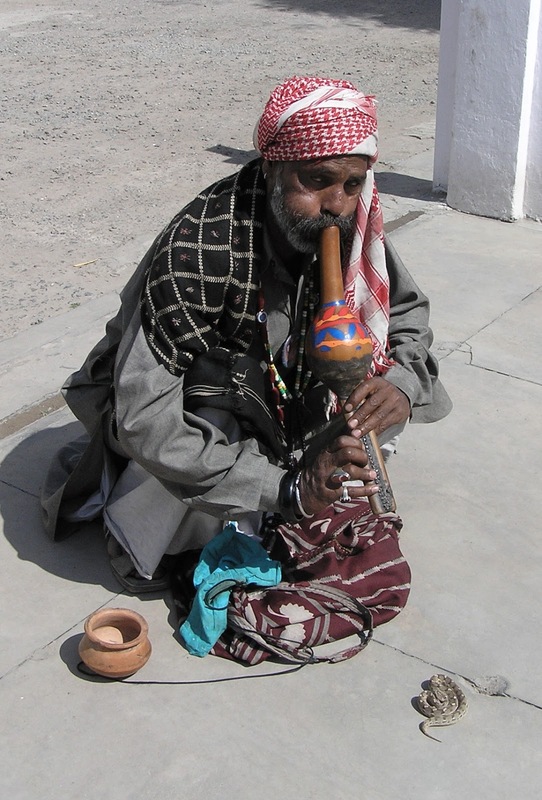 They all tell me that snake charmers are very rare these days (which I believe, have you seen one lately?) so I was very lucky! After all this excitement we got home just in time to change for the wedding. This next part was to be the official marriage ceremony. To my astonishment, the men close to the groom all wore red turbans with those fancy combs. The groom’s father was in full moghul costume – with narrow tights and a long waistcoat. The groom himself was wearing a heavy curtain of white flowers and red roses in front of his face. He couldn’t see a thing nor do much breathing either… The groom had to sit on a couch with this heavy screen in front of his face. People came and went, sat down, walked around and visited. Suddenly I noticed that the groom was signing papers. Leila told me that the groom and bride were each asked three questions. If they said ‘yes’ they signed the papers to the marriage agreement. Once the bride had signed, friends would come out of the house (the bride was in the house, while the groom was in full view outside), carrying baskets with small red and gold pouches which held nuts and candies. That was the sign that they had both said yes and signed and were now married. No announcement was made, no speeches at all. I asked why they were not together and was told that this way, if one of them wanted out when asked the questions, they would feel free to say no. Strange but kind of makes sense, doesn’t it? Especially since marriages were often arranged. So once we had our little bags of nuts, the bride was escorted outside and the parents gave the children to each other. No clapping or cheering. Just once that was done, relatives started kissing and congratulating each other. 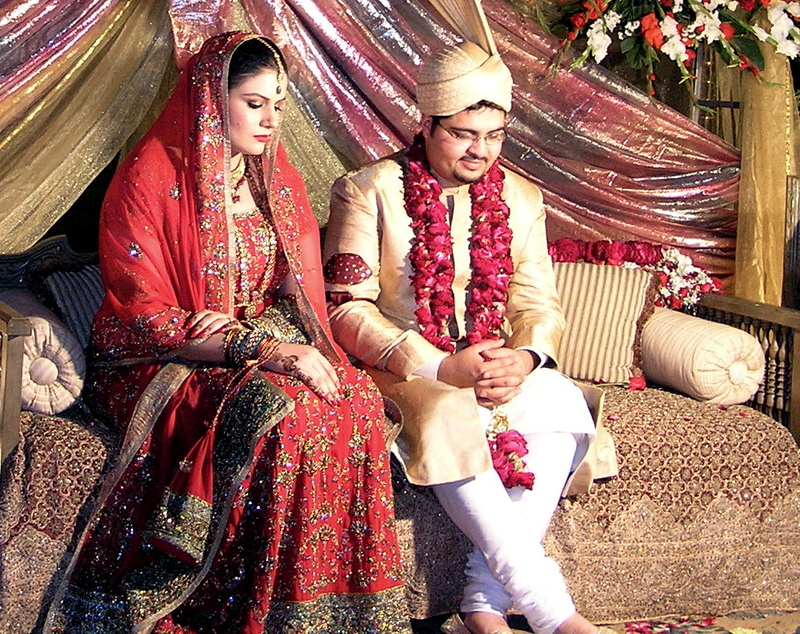 Pakistan Adventures – A Wedding! I did not sleep much. I think it was the sewage-smelling sauce that I dipped the little balls in, in the restaurant yesterday, that didn’t agree with me. Leila said it is supposed to act as a cleanser. Buildings, like the bank and a shopping complex, all have private security guards. They look military and each carries a huge rifle. I’m not sure why because it is contradictory to what I keep getting told: there is no crime. But I guess thugs do exist everywhere. We drive to the main public library of Lahore, a huge white colonial building with arched, painted ceilings, dark wood paneling and rows and rows of bookcases. An Urdu sign in copper over each door said ‘Read, read, read’ – an order given by Mohammed himself. Next we walk across a craft market where weavers and potters have their wares displayed, but the most amazing stuff was those well known round jars with lids, with very fine intricate designs on them. I always thought there were painted on, but it turns out that the (wooden) jars were painted in several layers of paint and then the design is scratched off. If you scratch lightly the dark blue gives way to light green, if you scratch harder, the red layer shows… It is amazing! When we stepped outside (it was around 30º C) a group of colorful dancers was performing. As soon as they saw my pale face, they crowded around and danced for me. I am still the only westerner around. There was also a camel behind the museum with a little baby camel which sucked on my fingers!I am starting to know my way around Lahore. Traffic remains mind boggling. I have figured out now that lines on the road are irrelevant. It is space you aim for. Whenever there is some space to the left or right, you veered towards it. Never mind the scooter or bicycle in that space, he who is strongest wins. If the open space happens to be on the wrong side of the road, that’s OK too. And when turning at an intersection it really doesn’t matter how you get across, you just go. The car you see most often is the Suzuki Mehran. It must be a special Pakistani edition: without signal lights. I saw three donkeys in a row carrying huge loads of bricks. I don’t know how they stayed on: three layers of bricks right around both sides of the donkey. Perhaps each brick was held by a string. I can’t image the weight of that load. I saw donkeys carrying grass, bamboo, a bed, people, firewood, bananas, and much more. Leila and I brainstormed our book idea for children, to encourage kids to read and to tell them about libraries. I wrote a story and read it to her. We both cried so I think it’s working. A little while later we leave for a different part of town. The streets got narrower and narrower until we found a little parking spot. Each parking area, near shopping areas, a bank, etc. has a few men who sit around and as soon as a car drives up, one of them gets up and helps the driver to park. They get a few rupees for doing so. The three of us women headed down the narrow street. On both sides were open stores, each one just a small square or long and narrow. Each store has its own specialty: embroidery, bags, table linens, kitchen items, shoes, food, etc. The street got so narrow it was maybe 1 1/2 meters wide and still rickshaws and mopeds came honking along it. It was packed with people yet no one bumped into another. I asked them if should be aware of pickpockets and was told that this does not happen here at all. In fact, Leila’s daughter said that she had often forgotten her purse in a shop and found it still sitting there much later. Leila told me that once she was shopping in an area were the shopkeepers spoke no Urdu. She had made a purchase in a shop and a little while later a man came running and shouting after her. She didn’t know what he was calling and walked away faster. But the man kept chasing her. When he finally caught up, he said panted “For heaven’s sakes, don’t you want your change? !” and handed her some money back. She explained that in the Muslim faith they prepare in this life for the afterlife and how you treat others is very important. They also said that it is considered inappropriate to charge too much for an item. They is no bartering and no one bothers you. It is a very safe and pleasant feeling. We walked and walked along the narrow streets, in one alley and down another. We got lost a few times in the labyrinth of shops. The sky got darker and lights came on. Women wearing shawls of all colors, men in long tunics, some with turbans. I totally felt like I had a part in a play of Arabian Nights. We saw a coconut vendor who sold both slices of coconut and coconut juice. There was a strawberry vendor. 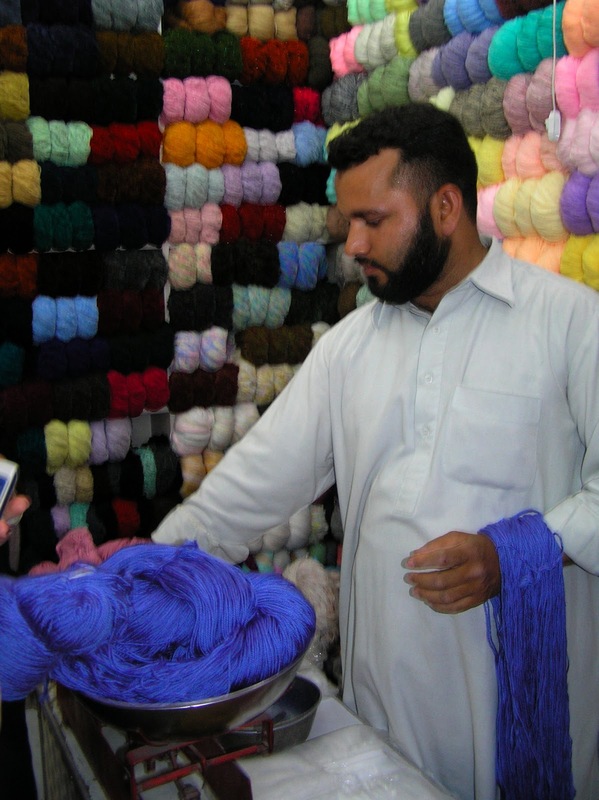 A man who dyed cloth, and we went inside a wool shop where the walls were lined in colors of wool. A knitter’s paradise! I bought several skeins of cotton. These were placed into an old scale and copper weights balanced the scale and then the vendor told me how much it was. I felt like I was shopping in the Middle Ages! We all bought jewelry: necklaces and earrings and rings. Amazing stuff. I bought more gifts for everyone – my suitcase will be full! The girls found fabrics for their outfits and we still dropped them with a seamstress to have them stitched for the wedding. As soon as we got home we had to leave for the wedding party, so a quick shower and change of clothes. At home my idea of dressing up is a clean pair of jeans. Here I wore a bright blue silk outfit with dainty shoes, new jewelry and a white shawl with seashells on it. Fun to dress up! The women of the family all came and were dressed gorgeously in silks and shawls. They had their hair braided with dangles with mirrors in it. When we got to the house of the groom’s parents, the driveway was lined with rose petals and candles. In the living room we all found a spot to sit on colorful silk pillows on the floor or on low benches along the walls. There were mostly women but also a few men. Two musicians sat on the carpet and played a large stone pot and round drums. People sang songs, typical Oriental singsongy chants. We all clapped along. Sometimes somebody got up and danced with arms swaying in the air. People dropped money in the circle on the floor. Every time someone got up they would urge others for more money and to dance more elaborately. I asked what the money was for and was told that it was to be given to the poor. After an hour or so of singing songs, we all got up and went outside in the huge garden. Long tables lined the back of the house, under the palms trees, and were laden with food. There was meat being roasted and bread being baked on fires. We loaded up plates with rice, baked fish, lentils, potatoes, all sorts of other weird concoctions. Had an interesting talk today. 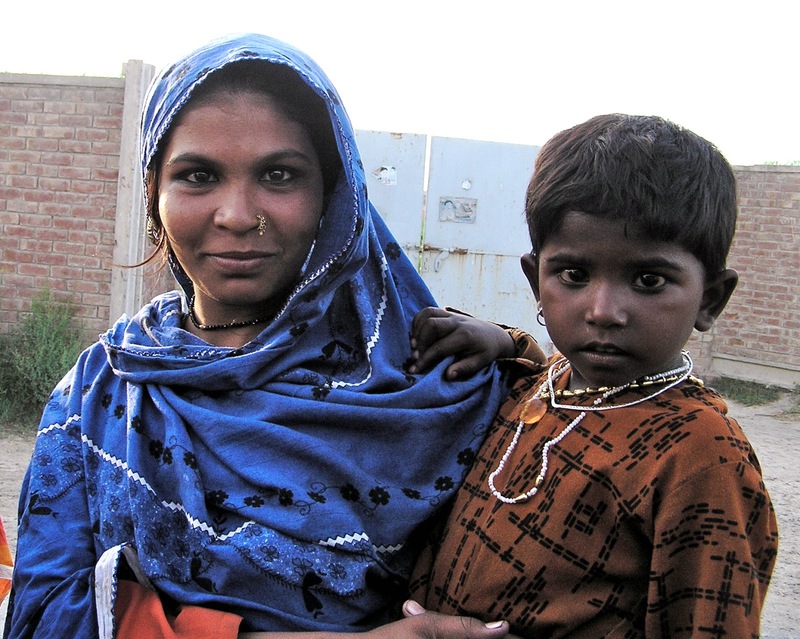 I am learning, bit by bit, many interesting facts about life in Pakistan: there is medical care here for everyone. You can get insurance but many people have none and don’t need it. It costs nothing to have babies in hospital. Poor people will get free care from doctors. My friend knew of a previous employee of the family who had retired. They met him recently and he had received a triple bypass operation free of charge. Most families here live with different generations in one house, like this family. It is more economical, they say, and it allows the grandparents to teach the little ones. Education is very important. The grandparents teach the little ones to be kind, to speak in kind voices, to be disciplined, to study hard. Everywhere around the city are tall skinny towers. Five times a day there is a long chant broadcasted that is a call to people to pray and to stay “on the straight path”. Leila says ‘God does not ask us to pray for him, but for ourselves. It is a time to reflect on what we are doing”. While the chant is sounded, women cover their hair and so I do, too. Around lunch time they have ‘tea’ here, which is just tea with milk and sugar and some fruit, yogurt or a cheese sandwich. Then around 3 PM they eat lunch of hot meat dishes, lentils, rice and round flatbread. Then at 5-6 they have tea again and don’t eat dinner until around 9 PM. I am careful to find dishes I can eat without getting too many digestive problems. When they tell me “take this, it’s not spicy” I have learned that it will merely clear my sinuses. Anything stronger and I have smoke coming out of my ears. Around dark we all got dressed and were busy ironing silk outfits, brushing and braiding hair etc. 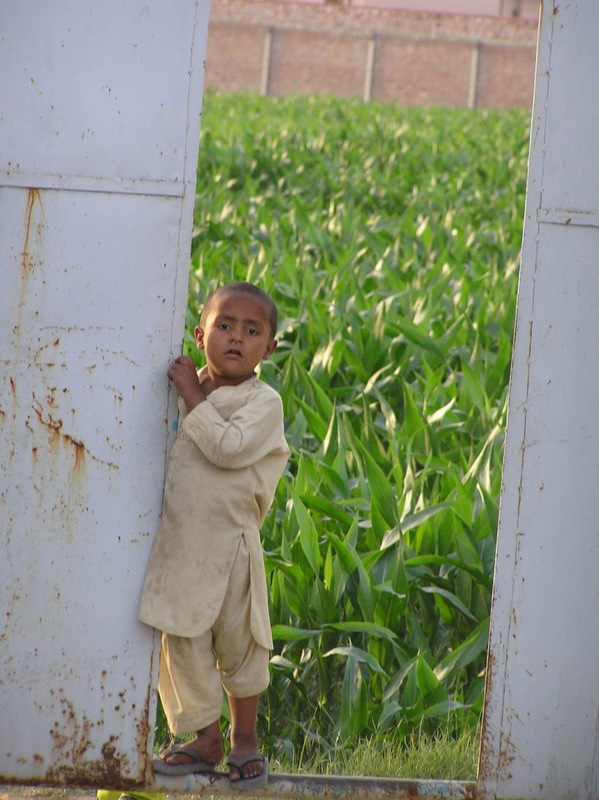 The children were also coming this time so they had to be bathed and dressed in little white shalwar and long tunics. I wore my plain blue silk shalwar and a nice kameez with gold design in the blue. We left the house around 9. The party, tonight, was at the home of the groom were we had already been last weekend but I didn’t recognize it. I thought we were at some very fancy hotel. The house is enormous, all one level and very Mediterranean with palm trees. There was an huge tent sent up behind the house, made of beautiful cloth with gold print. It had a large carpeted sitting area with colorful pillows. And rows and rows of comfortable chairs, all draped with white cloths and tied with ribbons and bows. There was a ‘stage’ platform on which a man and (blind) woman sang lovely songs. The backdrop for the stage consisted of a long bamboo pole hanging horizontally draped with long straight garlands of fresh flowers: small white flowers and soft orange roses. (roses are very inexpensive here: I bought my friend 5 DOZEN fresh red roses from a street vendor for $1.25). Some young men gave a lovely concert on guitars and the traditional sitar (a cross between a cat and a guitar!). They had composed a medley of Arabian music crossed with Spanish guitar. Very nice. After an hour of sitting and listening to the singing, we all got up and lined up at long tables with food. There was even green salad and fruit salad. And squares of fried cheese, fish, lots of meat and lentil dishes, rice and more. Dessert consisted of chocolate cake, strawberry puffs, and sweet noodles made from a flour paste, squeezed from a piping bag on to a hot surface into a thin long zigzag ribbon and slowly fried like that. They turn a soft pink and are very, very sweet. After dinner there was tea. And we all sat down in the chairs again for about 4 hours of listening to very traditional singing. I think this was called the Qawali. A group of about 12 men in sober brown tunics sat cross legged on the stage (for some 4 hours with getting up!!). Two lead men wearing small caps sang and played the harmonium. The songs they did were apparently thousands of years old, folk songs which really sounded nice. Very happy, slow, chant like. The men formed the back ground choir and clapped hands while sitting very straight and without resting their elbows…. The crowd kept nodding or shaking and sometimes men moved their hands, turning it in the air and nodding. I had no idea what the songs were about – they are in Urdu, Persian and all sorts of other languages and dialects. At some point baskets of candy were passed around, and also something of which I didn’t know what it was: paper points looking like little icecream cones. I thought they were melting because they were all sticky and runny. Inside the paper was leaf (of the betel tree) with betel nuts (not sure what they are) soaked with rose water and other flavors. I licked it and tasted it but didn’t eat it. If you take some tree leaves and soak them with an entire perfume bottle, then you have what this resembled… More tea and soft drinks. It’s strange not to see any alcohol at parties like these. But having no alcohol may well have saved the country. The next morning we had a meeting at Alif Laila with a lday who came from Islamabad and who is in charge of Save The Children in Pakistan. We went to the library and saw the mobile library that is run by Leila’s project. Most of the school children who come here are girls. The girls are incredible kind and nice, very polite and sweet. At age 13, very different from North American girls who wear make-up and cool clothes. These kids giggle and shyly smile ‘hello’, then giggle again. They are eager to have their pictures taken and love to learn. Tonight we had a good discussion about education. My friend’s son said that he was fortunate to get his university education in the USA because he was so self motivated. He said that within the first semester he was offered a full scholarship and even a stipend. “The US is incredibly rich where educational institutions are concerned,” he said, “As a student I worked on a multimillion dollar super computer and in a library with millions of books.” He said that he probably took 20% of his lectures and for the rest worked and studied on his own. He also said that 90% of his fellow students were totally not motivated and most joined fraternities and didn’t study much at all, taking all the resources at their fingertips for granted. At our library meeting, we shared what we have done and planned and read our story to the Save the Children rep. She loved it and thinks they will be able to publish it here. 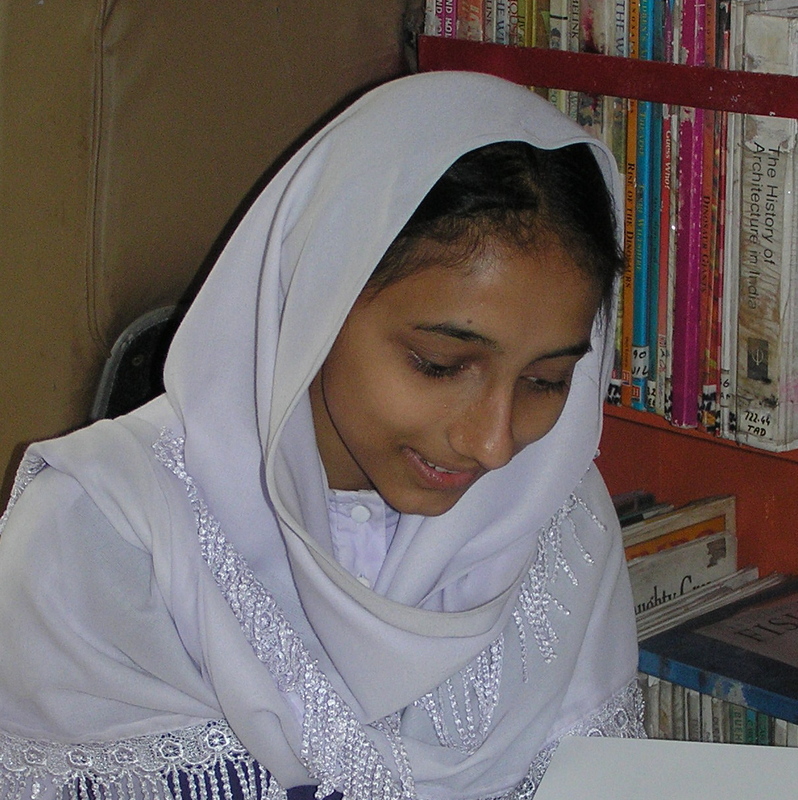 We hope to give a free book to all Pakistani schoolchildren. The story I wrote with Leila is a fictional tale about the power of libraries and reading. It really did turn out nicely. I’ll also be doing a day of workshops with students and teachers. At Alif Laila, the girls who work there called me into a room and said it was time for mehndi. I had no idea what that was… They brought out henna and decorated the insides of my hands for the wedding. All ladies, girls, at a wedding do henna. It is a big deal here. They all get together and do each others hands. Henna is an ancient tradition, a paste made from leaves of the henna tree. It comes in a very pointy tube. They cut the point off and applied it to my hands making all sorts of intricate designs. It sits on the hand in a dark brown paste. Then it has to dry for an hour so you can’t do anything… just waves your hands in the air to dry. After a long hour I got to scratch off the dried muck and the design was on my hand in a bright orange. That gets darker as time goes by and will eventually wear off after about a week. “You are not really going to Pakistan, traveling alone? As a woman?” that was the reaction of most of my friends. “You might not come back alive,” was the reaction of one of them. And the lady who invited me to her country, her home, to be part of her family for a while – was also a booklover, a writer, a teacher. What could possibly go wrong as long as I stayed with her, a true Pakistani. I had no qualms about visiting Pakistan at all. And so I flew from Portland to London, to Lahore. It was just getting light as the plane landed and I didn’t see much. Flat and green pieces of land, farms, cut through by dirt roads. No paved roads. Then suddenly a jumble of concrete houses and streets. I realized from the air that they were mostly driving on the left although that was hard to tell, they seemed to drive mostly in the middle. That was confirmed once I sat in a car. When two cars are about to collapse, they then quickly veer left or right to just narrowly miss each other. Passport control was quick. The officials were all uniformed women stamping the passports, some wearing shawls, some not. Leila (not her real name) was waiting and had no trouble recognizing me. Her chauffeur quickly whisked away my luggage and then drove us through the city. Well, it is all those movies make it out to be….. Broken concrete buildings, dusty dirt roads, FULL of people walking along wearing long white shirts and turbans; old old rusty cars, carts laden with freshly cut greens drawn by donkeys, crazy old motor cart, mopeds, anything else on wheels, all honking and racing at top speed. The main goal seems to be how many other bumper carts you can narrowly miss. Leila’s house was a lovely oasis in a jungle of noise. We had lunch in the large kitchen. They must have cooked outside since there was no heat from an oven. There were about ten different dishes, all very typical Pakistani food. Eaten with the fingers with a freshly baked flat bread, and served with yogurt to soothe the spicy foods. I am incredibly lucky: my visit coincides with a cousin’s wedding and I am to join them as family for the next five days of celebrations! Tonight is the formal asking for a blessing of Allah, praising and thanksgiving. After that it’s party time. I already have two gorgeous outfits, a green satin pair of very baggy pants with a long striped top and a bright blue set – the set is called Shalwar kameez. 1] Qawali. This first one is the blessing/thanksgiving. 2] Mehndi. A festive, colorful gettogether where candles are lit in special ‘mehndi’ painted pots and bangles are given away to guests. 3] Sehra Bandi I Barat. This is the official signing of the marriage agreement and most formal part of the wedding. 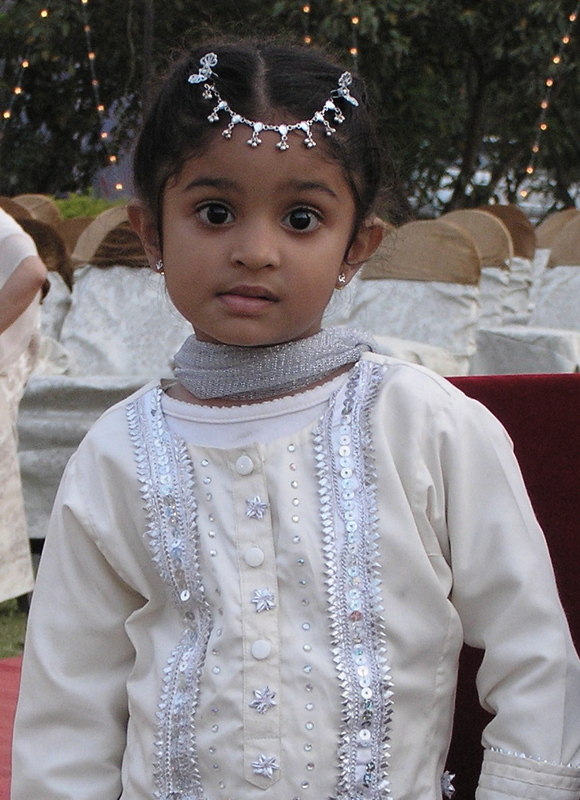 4] Valima. A festive gettogether to dance and sing and celebrate. Today’s “party” – Qawali – was very interesting. Leila, her youngest daughter, daughter-in-law and I left in one car with chauffeur. As soon as you venture out of the house, you dive into a whirlpool of noise and chaos. The bridge is, like all rickshaws and all dump trucks, elaborately painted in bright colors with intricate designs. The rickshaws sound like they all have a moped engine and are only driven at top speed. They consist of a canopy over a three-wheel motorbike and seem to be used to transport a minimum of eight people, often more – families with babies, toddlers and grandmothers all piled into one rickshaw. They are a form of public transportation, like a taxi. The driver has a natural gas tank sitting right next to him. Anyway, as we got into downtown Lahore the traffic increased. Dusty roads full of pedestrians, mopeds, donkey carts, goats, cars – all honking and racing. And no one wears a seat belt: that would take the fun out of driving. At 80 KM/hr we miss everything else on the road by a hair. The roads are lined by broken brick buildings, people squatting along the sidewalks, talking to each other, eating and making music. Five times a day tall towers around the city broadcast a chant that indicates prayer hour has started for a certain prayer. The newspapers do not write terribly negative about the western world at all. One of the major news events was about a man who had converted from muslim to christian and received death threats because of it. The outcry in Pakistan was just as loud and against this injustice as it was in the west. They are just as opposed to, and abhored by, terrorism as any other person. Soon we arrived at our destination and entered a long, low house in Moroccan style. Huge entree, many rooms and curved staircases. They use much marble for floors and stairs. In the main room, a huge square Persian rug was covered with white cloth and full of colorful round pillows made of Chinese silk. This was the groom’s home. His parents welcomed us and everyone keeps telling me that I am part of the family. I wore green silk baggy pants and a striped long top with my own purple silk shawl. We sat on settee’s and floor pillows. More and more relatives came, probably fifty people in total of all ages. When the ceremony started, we all covered our heads with shawls and one of the elder women chanted a long, looooonnnnnnggggg prayer from the Koran, sometimes the other joined in. After my 24 hour flights and busy day it was hard not to fall asleep. Incense burned somewhere and we were all given a paper flower from a basket that had jasmine scent on it. Two musicians came and played a small drum and clay pot. After the prayer part it was time to eat. Everyone kissed everyone else and then descended on the kitchen where a table groaned under the weight of many dishes: rice with beef, curries, salads, corn, Nan bread and a flat bread called roti like pancakes, yogurt, and much else. A separate table held cakes, chocolate things, sweet noodles, etc. No alcohol in this nation. Just small glass bottles of coke and orange pop. After the food I thought we’d go home to go to bed but, as our car dove back into the traffic, it became clear that we were not headed home yet. Instead we went to the Basaar, where I was to buy cloth. It was late but still as busy as if it was mid day. 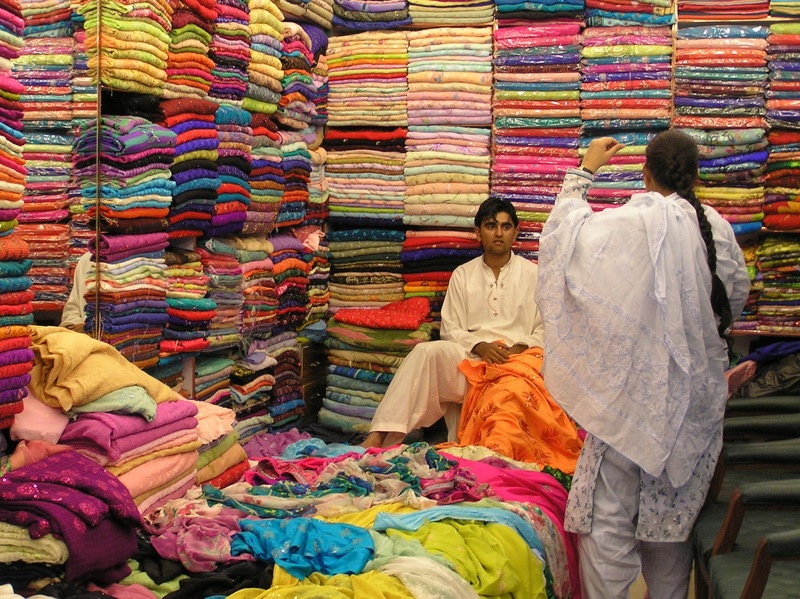 Piles and piles of colorful fabric were piled high in each stall. A big open air market just with cloth, nothing else. I bought 3 or 4 shawls for gifts. They are woven and gorgeous. There is no bartering at all, which seems strange in such a noisy outdoor market. But much more respectable than the bartering that happens in Mexico. “You pay what it is worth, not more but also not less,” was the sensible explanation given to me. I had to choose fabric for another outfit for the wedding. The fabric comes in sets of three: one plain color makes the pants, one is for the top, the third makes the shawl. You cannot mix and match your own choices, you select a set. The fabric was measured by arm length and cut. Then you give it to a seamstress and will see it back as an outfit in your size. The next morning I had grapefruits, toast and dark, sweet tea for breakfast. Sunday does not seem to be a day off. Construction in the new subdivision behind the house is in full swing and cars on the road are all happily honking. A man walked by herding his goats. The table was laden with rice, vegetable dishes, prawns, beef, and different kinds of breads. Dessert was lovely scooped out oranges with a leaf still on the cap, filled with creamy fruit salad. We drank thick, brown fresh apple juice. We had an interesting discussion about politics and war and generally they concluded “Maybe (misunderstanding) is our own fault because we haven’t shared enough with the rest of the world of what we believe in.” My friend explained that the muslim faith includes many parts of Christianity, including Jesus as a disciple of God and that the Koran includes parts of the Bible. “Our religion is very tolerant and excepting,” she said. The women at lunch talked like mothers everywhere: about dieting, kids and the dangers of drugs. We visited ancient Lahore Fort with many gardens, mosques and other ancient buildings from Moghul times; saw the Badshahi Mosque and the Sish Mahal. 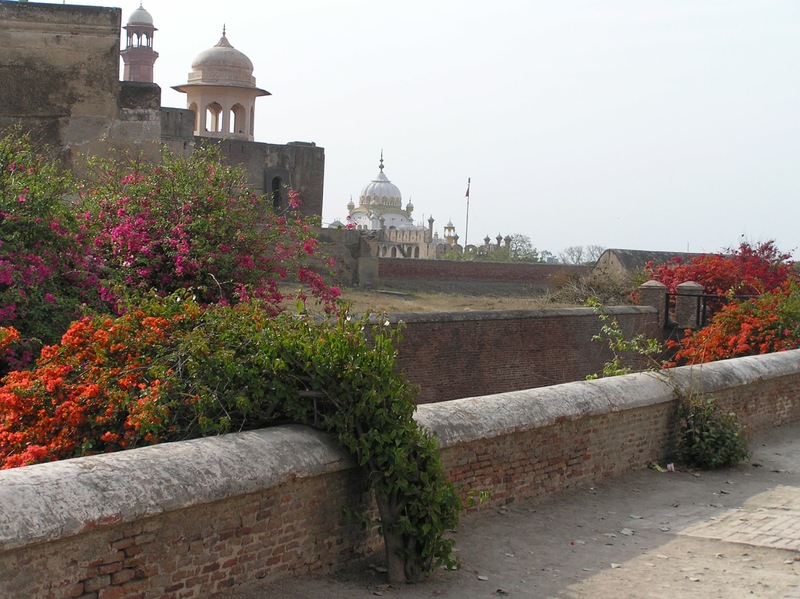 We reach Fort Lahore by driving through old downtown. Narrow dirt roads that get more and more crowded. The roads are lined on both sides by roadside stands and merchants. Amazing things are for sale – I didn’t have enough eyes to take it all in. I spotted a boy pushing a wooden cart which had a small fire burning inside. On top he roasted nuts or popping corn. I saw cages and cages of life chickens, and hanging dead chickens. There were entire goat markets where men in long robes were selling small goats. Oxen resting along the side of the road. A stand with sugar cane stems piled high and a man cranking a metal wheel on the side of a machine to crush the cane into juice, which he sold. Amazingly, the chauffeur maneuvered through walls of people and animals and drove us right to the gates of the historic park. There, women came to the car before we even got out, to sell us woven grass baskets and fans decorated with colored feathers. Women don’t handle money in public here so Leila’s chauffeur pays for the things we want to buy. He also guarded our shoes while we entered the mosque. The entire day, I was the only westerner and people goggled at me everywhere. Even with a shawl around my head I stood out. Kids gaped at me and an entire school class swarmed around us (school girls all wear light blue kameez and white shawls) and giggled, saying hi! When I asked if I could take their picture, they were delighted. Their teacher told them “This visitor wants your picture. Show her how happy you are to live in Pakistan.” They all crowded around and wanted to touch me. We walked around the grounds, saw the hall of mirrors which UNESCO is restoring. Saw the balcony where the Moghul emperor used to address the people. Blooming bougainvillea cascading over brick walls. On the way back I noticed donkey carts loaded with golden, round milk jugs. 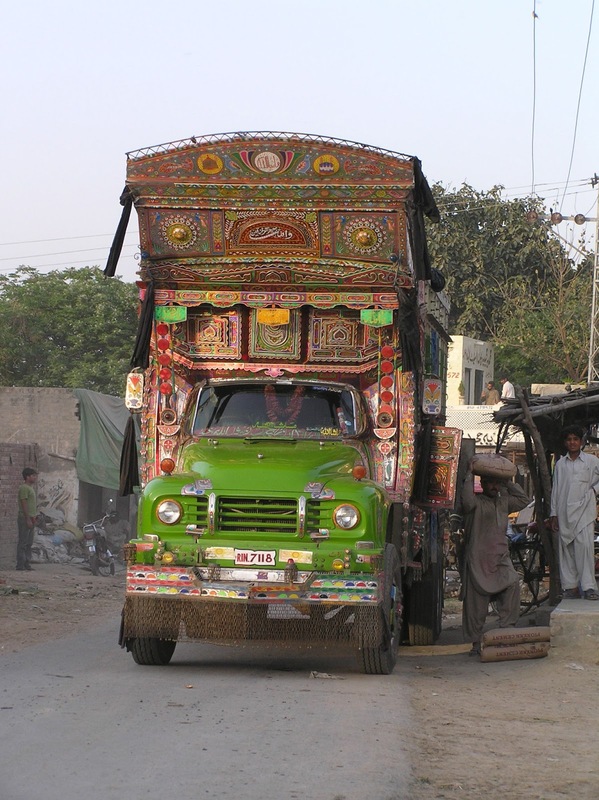 Trucks and tractors are incredibly beautifully painted with intricate designs and bright colors. Motorbikes with at least three but often five people on them. A horse drawn wagon loaded with bags (potatoes?). And dust and people walking on bare feet. Carts loaded with piles of bright oranges and grapefruits. It seemed a medieval scene until a vendor whipped a cell phone out of a pocket of his robes. Behind broken brick walls I saw small squares with open doorways. Many people live in very poor conditions. Buildings look like they are broken but I’m realizing they are so old that the bricks are breaking away. They simply re-use old bricks to pile into new walls and so everything looks like it is being demolished. When we got home, Leila and I worked on our book plan: a picture book for Pakistani children to show them how libraries work and the joy of reading. 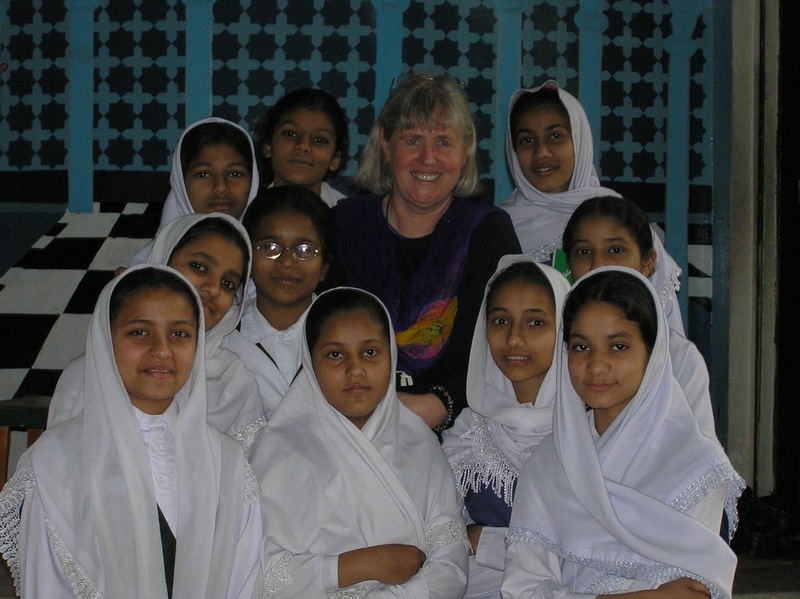 Leila is working with schools, running a library program and working with Safe The Children UK on bringing literacy standards up for all children in Pakistan. “We have an oral history, not one of books,” she explained and is looking for help to show people the importance of books and reading. As soon as we head out for the day, the sights and sounds assault us and never cease to amaze me. Honking cars and everything else that drives, is hilarious. I’m never scared because their cars are spotless and dent free. But at each intersection, three rows of traffic from four directions gets together. Whoever is boldest (and they all think they are) inches forward without hitting the bicycles, mopeds or other cars although you could not fit a sheet of paper between the bumpers. The funny thing is that all these people honk like crazy but no one raise a finger or shakes a fist. The second they get out of the car they are polite and friendly. So the honking, somehow, is not meant to ‘scorn’ the others on the road. It is simply a “watch out – I’m coming” kind of honk. We race toward the city and see the usual donkey carts, laden with firewood, freshly cut grass, sugar cane, building supplies and anything else. Women sit on their bare feet and hunches along the dark red (silt) canal and beat their laundry with stones. Trees are hung with baseball caps for sale, towels and t-shirts. Today Leila asked the chauffeur to stop near a corner and he handed a beggar a small package. I asked why (when I arrived I warned her that I would ask explanations of everything I did not understand and she always answers me patiently). “This week our grandson was ill. Allah made him better, so now we give thanks by sharing with this man. The package contains food which he can take home and cook.” She also gives out money at some times. The few beggars there are, hang around intersections and knock on car windows. He who drives a car has money. No sense in begging elsewhere. We reach Alif Laila, Leila’s library project: an inner-city library building which is absolutely lovely. The round building is painted with scenes from Tales of 1001 Nights (which is what ‘Alif Laila’ means). It is in a lovely park like setting. A painted bus with sayings like “Readers are Leaders” etc., picks up children from different schools. These schools have no libraries and no books other than text books. At home these children are not exposed to reading either. Most come from very poor families. In the library they are read to, and can take books home. One class consists of about 60 children here and 2 classes come at a time. The half size school bus is thus loaded with 100-120 children! After stories, the children go to another building which houses the offices of the Alif Laila project and has art rooms and a computer lab (with 3 languages on the keyboard!). This is the only opportunity the children ever have to learn typing and using the internet. My friend says “Like Sheherazade of Arabian Nights, who had to save her life by finding stories, so we have to save our life all the time by finding funding and sponsors.” Save The Children from the UK is the largest sponsor of almost all projects. I wonder if learning the skills of reading and typing might not also save the lives of some of these girls. In the library I read Emma’s Cold Day to about 120 children. 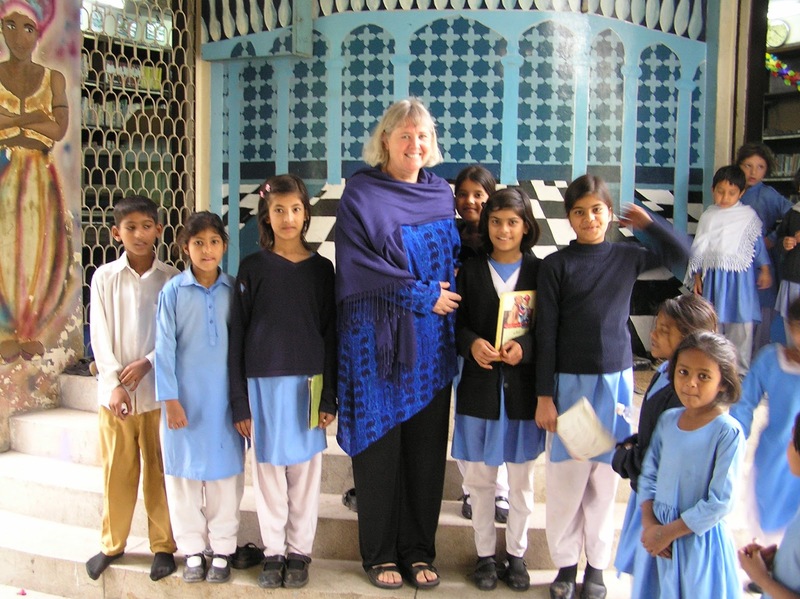 Leila translated into Urdu because these are young kids just learning English, still being taught in Urdu. We had lunch at an adobe building with palm trees in front and a man with turban and pointy shoes opening the door. One one side of the door was the seating area. On the other side was a large ‘village’ area with different food stations as you would see in small towns: a wooden cart with copper pots, a large charcoal grill with all sorts of shish kebabs. Bowls and bowls of stuff – a large orange press for juice, etc. We ate the strangest things (to me!) starting with a shredded salad with lots of chick peas, with runny yogurt poured over it. Then paper maché type, very light balls with a hole in them. Inside rattled chick peas. You had to dip them into a jar of brown liquid. They are called gol gappa. Then rice and meat. The cook, beaming with a huge smile, asked if I would like chicken kebabs without spices and proceeded to barbecue meat just for me. Then very unusual desserts: a small flat stone bowl with rice pudding in it. It had what looked like a piece of tinfoil in it. That was real ground silver for minerals… called chandika warq. Next we drove to the silk market where Leila tried about six stores in vain to buy wedding material for the daughters’ outfits. Each store is a small square space. Walls are lined floor to ceiling with colorful bolts of fabric. On the floor is a row of chairs facing a meter high platform that runs the length of the store. The salesmen are sitting on their hunches and bare feet on this platform. The customer sits on a chair and points at colors. He pulls the bolts down and unrolls the three that go together (pants, shirt and shawl). This goes on until there is about four feet of fabric piled high onto the platform, the salesman walking across all of it on his bare feet. And then the lady shakes her head and walks out…. After this we stopped at an Artist Cooperative. Amazing. Wooden furniture, copper pots, onyx carvings, colorful shawls and bags, carved statues of camel bone (looking just like ivory). Some things are so cheap that I don’t think they even register on the dollar scale: 20 rupee cents for a small carving. I bought gifts to take home, feeling like I was supporting the local economy. The suitcase which I had planned to leave behind, will be coming back! Tomorrow is another day! Inshallah (= God willing)!